Google Pilipinas gift items - I so like the notebook for blogging ever. Mugs by baratodesigns.i.ph - This is made by a fellow CDO blogger. The most exciting in this GandaEverSoMuch’s Blogsary is that its not for bloggers only but new media's are able to join too. So if your a plurker, facebooker, twitter addicts and more come and join the fun celebration! This will be until August 1, 2010. 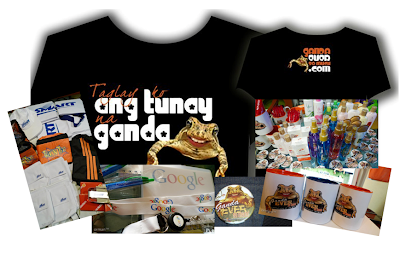 Check out GandaEverSoMuch.com for details and mechanics of the contest.